A couple and another driver became embroiled in a heated argument while waiting to enter a carpark along 32 Punggol East Road on Saturday (Aug 4) at about 1.40pm. The dispute resulted in the driver of a white Nissan convertible performing a flying kick on the couple's car outside Sing See Soon Florist and Nursery. 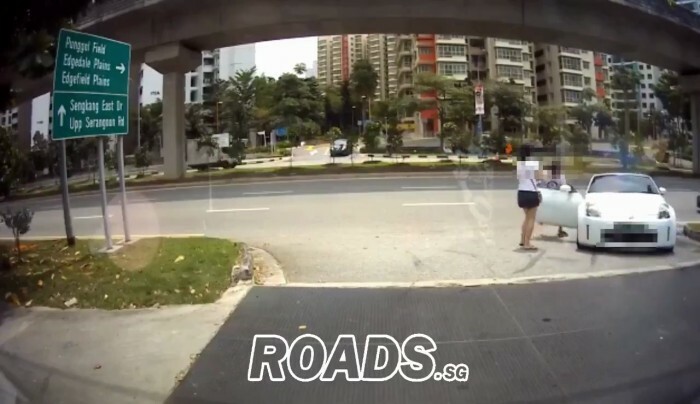 The incident was caught on the couple's car camera and posted on Roads.sg's Facebook page. In the video, the Nissan driver appears to be unable to enter the carpark. He then gestures at the couple to reverse so that he can get out of the queue to the carpark. The husband in the car with the car camera is heard saying, "Wah piang eh! What are you trying to do?" His wife is then says in Mandarin, "This joker can't drive, then blocks everyone." The other driver then stops his car and gets out and gestures at the couple to move their car. The two men have a heated exchange that cannot be made out and bleeped-out words are said before the woman is heard repeatedly saying, "I don't want to move". Both cars are at a standstill and the Nissan driver continues making hand gestures at the couple before making a three-point turn to get out. Frustrated with the exchange, the Nissan driver then gets out of his car and runs towards the other car before kicking their car. The couple get out of their car to confront him and the man is seen refusing to let the other driver close his car door. The driver then reverses with the car door still open, forcing the other man to let go. According to the Facebook post, the couple said that the other driver wanted them to reverse their car to the main road which was "dangerous" for them. "There are a lot of trucks plying Punggol East," the post read. "Moreover, we have a 6-month-old baby in the car. "He alighted his car and started scolding vulgarit[ies]. "After he reversed [past] us he suddenly got out of his car and jumped onto ours. "My son is only 6 months old and he got traumatised by this incident. "I am really very mad!" "I have filed a police report on this incident." However, after the incident was posted on Facebook, netizens said that the Nissan driver should not have lost his temper but pointed out that the couple did not help the situation either by refusing to give way. The police confirmed with Stomp that a report was lodged and investigations are ongoing.